With such a vast array of products on the market, it can be tricky to know where to start when looking for a new classroom projector. But choosing a new school projector doesn’t need to be a daunting task, just make sure you know what you’re looking out for. Whatever your budget and requirements, our experts are ready to help you find the device that will make a real difference to your colleagues and pupils. So read on for the Projectorpoint guide to classroom projectors as we look at the most important factors you need to consider. It’s natural to think that brighter is better when it comes to choosing a school projector, but sometimes a projector can be too bright, especially in a dark environment. However, it is true that projectors with a higher ANSI lumen rating will cope better with the onslaught of ambient light coming in through your windows and electric lights on the ceiling. It’s all about finding the right balance for the levels of ambient light in your classroom. If a projector is too bright it can be damaging to the eyes if you look directly into the beam, and the brighter the projector, then the higher the chances of this being an issue. We’d recommend no more than a 4,000 lumen classroom projector for a typical school installation. Furthermore, remember that looking at a very bright image in a darkened environment can result in eyestrain and headaches, so if you will be darkening the room when you use your projector then it’s best to keep the projector's brightness to a reasonable level. Running the projector in eco mode will reduce the ansi lumens rating of the projector by approx 20% and will extend the lamp life of the projector. Your next big decision is what resolution to go for. Resolution is the number of dots (pixels) that make up the projected image. The more dots there are the sharper the image is, so small text will be more readable. There are five main resolutions – these are called XGA, WXGA, 1080p, WUXGA and 4K. 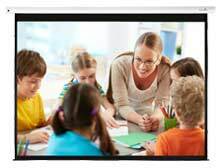 While high resolution is not necessarily the main concern in many education settings, classroom projectors are now available in a full range of resolutions to allow schools to choose the option that’s right for their specific needs. For example, in large rooms and auditoriums it’s best to select a classroom projector that has a higher resolution to allow even the most detailed documents to be seen clearly, but tight school budgets could reduce the number of projectors within your organisation’s reach. Fortunately, there are some brilliant 1080p Full HD projectors available for well under £500. HD projectors for schools shouldn’t be a luxury and although HD is a term that makes you think of home cinema; the truth is that education HD projectors should be the norm. For any school who has widescreen laptops for their teaching staff and who want the whole class to be able to see the content on screen clearly. In most classroom scenarios, this level of resolution will be more suitable. Read our guide to projector resolution to find out more about just how resolution impacts your projected image. A short throw projector means you can display a large image even if the school projector is very close to the wall you’re projecting onto. Even if you have the space to place the device further away from the projector screen or wall, there’s still the problem of shadows from people walking in-between the projector and the screen or other items of furniture that could get in the way of the displayed image. Dedicated ultra short throw projectors from the likes of BenQ, Epson, Hitachi, InFocus and NEC all offer great specification models at prices to suit all budgets. Don’t forget you still need to consider the resolution and brightness when you’re browsing short throw projectors. Away from specifications, our next piece of advice is a quick note on warranties. Like all electronics, projectors sometimes break down, and with heavy use in the classroom environment the chances of this happening are increased. If your projector’s out of action it could really affect your teachers’ lesson plans leaving the whole team anxious to get the device up and running again as quickly as possible. To make sure you’re covered in the unfortunate event that your projector does break down, be sure you consider the type of warranty you need, not just the length. Some manufacturers offer swap-out and on site warranties and if you’re ceiling mounting your projector you should look for models that include a de-install and re-install warranty – it could save you a lot of hassle if you need a repair. Lastly, don’t forget to check the warranty on the lamp as well as the warranty on the projector – they’re generally covered separately with lamp warranties often much shorter. Epson, NEC, BenQ and InFocus are among the projector manufacturers we work with who have particularly good warranties, so check them out if repairs are something you’re keen to be covered for. While you won’t be changing your projector lamp or carrying out maintenance for a while, the choices you make at the point of purchase can lower the ongoing costs associated with your school projector and influence how much time you need to spend maintaining the device. The main cost will be replacement lamps so it’s best to consider projectors with a longer lamp life. At the time of publishing this guide, BenQ and InFocus offer the most affordable replacement lamps, and don’t forget you can get a new lamp at a discount directly from Projectorpoint if you purchase it with your projector. As well as saving you money, having a lamp on hand will allow you to be back up and running in an instant when your lamp needs replacing. With developments in technology, you might want to consider negating the cost of replacement lamps entirely and opting for a laser projector. While they’re still a fair bit more expensive, the drop in ongoing maintenance costs and lamp replacement is making laser projectors an increasingly attractive value option for schools. If you’re not sure if it’s worth making the jump up to a laser projector, have a read of our guide to laser projection, or give the Projectorpoint experts a call on 08000730833. Another cost you may not have considered is the price of a replacement remote control. In the busy classroom environment it’s almost inevitable that the remote could get lost at some point during your projector’s life. Fortunately there are now universal remote controls available that are easy to set up with a broad range of projectors. That said, buying a projector from a popular and well established manufacturer will make it even more likely that it will be compatible with a universal control should you need one in the future. Finally, a couple of practical points about running a projector in a school environment. Your new projector will look great in your classrooms or school hall, but it’s a sad fact of life that a thief may prefer to see it elsewhere. There’s a lot you can do to protect yourself against projector theft and some projector models are specifically made with education security in mind, featuring built-in anti-theft devices. PIN code security and built-in movement alarms are particularly good features to look out for. If you’re investing in a classroom projector then why not explore the potential of a fully interactive classroom? There is a huge range of technology available that has been specifically designed for education, all of which helps drive up interactivity and engagement. Touchscreens, for example, are central to many modern classrooms, with some incredible software and hardware on offer at increasingly accessible prices. If you need any further help, we're here to deliver. Just give us a call or use our contact page for expert advice on choosing an education projector and other classroom technology.